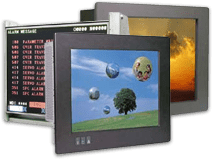 Dynamic Displays designs and manufactures our LCD displays and rugged industrial PCs to the highest quality standards, selecting state-of-the-art components with long life and multiple vendors for extended product life. We fully inspect each item throughout the production process to ensure the highest quality and submit the final production product to a 72 hours burn-in process before shipping to customer. To back up our commitment to quality, Dynamic Displays offers a two-year limited factory warranty as well as lifetime support on each of our products. Dynamic Displays production process begins with our in-house electronic and mechanical design team, drawing on over a 26 years of experience in devising rugged, long-life LCD displays and industrial PC products that incorporate the latest technology to maximize performance, stability, and reliability for industrial and military applications that operate in a harsh environment, 24/7. Dynamic Displays manufacturing process takes place within our facilities in Eau Claire, Wisconsin, the heart of the Midwest, allowing complete control of assembly, test and all inspection processes. This level of quality control, from design to production, underlies our 2-year warranty.